The team recently visited Tithanizane Orphan Care Centre, Dairy Farm and Community Library. This innovative community centre combines several concepts in order to be of maximum benefit to local beneficiaries. The cows were gifted through the MASAF programme and provide milk and calves for the community to sell. In addition a new Biogas Digester, developed under the MREAP programme, is currently under construction. The orphan care centre was started by a group of volunteer women from the village and several surrounding villages. There is a high number of orphans in the region due to parents dying from AIDS, young mothers dying during or after childbirth, and from natural causes. Orphan children are left to fend for themselves and can easily be led towards a life of crime and destitution. For many orphans it is unlikely that they will survive long without some kind of intervention. 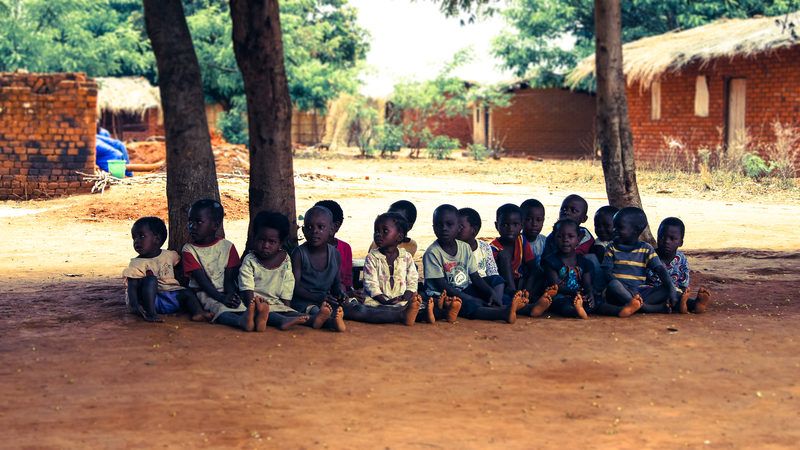 The orphans sit patiently whilst the team meets with the group village headman. The centre provides a basic education and the opportunity for play and interaction with other children in the community. This helps the children have fun and remove their minds from what is a very difficult life. The women volunteers also try to provide a regular supply of food to keep the children healthy. Part of this involves each woman providing some food and also some firewood. This has a major cost and time implication on the women who also have their own businesses and families to look after. The centre does not have any regular source of funding and as such every day is a struggle to provide for the children. It is hoped that the new biogas facility will make life easier for the Women volunteers, making it quicker and easier to cook food for the orphans. This should relieve some of the personal burdens the women take on whilst volunteering to look after the kids. Other challenges facing the orphanage are the need for a new roof to prevent the library books from getting wet and the growing number of children accessing the facility. The women expressed a desire to connect with an NGO or other organisation that could support its development (Please contact us if you know anyone who might have an interest).